It’s a full hour of baseball, stats, and meta-talk on the Triangle Podcast. First, Jonah Keri talks to Brian Kenny, host of Clubhouse Confidential and MLB Tonight on MLB Network. 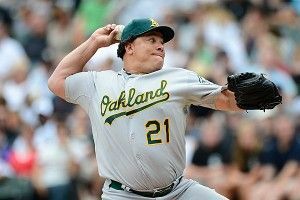 We delve into the Melky Cabrera and Bartolo Colon PED suspensions, examining them from all angles: Is MLB’s PED policy working? Are the penalties stiff enough? Should we reassess some of baseball’s records, particularly the ones set by pitchers during the height of the steroids era? And why does baseball get so much flak for PED use while other sports mostly avoid negative publicity? We then weigh in on the state of analytics in baseball, and a few pennant contenders, including the wildly underrated White Sox. In the second segment, Jonah talks to Randy and Jason Sklar of the Sklarbro Country podcast, the History Channel’s United Stats of America, ESPN Classic’s late, great Cheap Seats, and about 85 other shows. Topics explored include the 2011 Cardinals’ miracle World Series run and how we obsess over sports stats but often make statistically poor decisions in our real lives. All that plus the inevitable sports-as-punk-rock question: Have stats gone mainstream?